flydubai has inaugurated its flights to Thessaloniki becoming the first UAE carrier to offer direct flights from Dubai. Today’s flight from Terminal 2, Dubai International landed at Thessaloniki Airport "Makedonia" and was greeted by a water cannon salute. On board the flight was a delegation led by Jeyhun Efendi, Senior Vice President, Commercial Operations at flydubai. On arrival in Thessaloniki, the delegation was greeted by Khaled Alqaydi, the Chargé d’Affaires for the UAE Embassy in Greece and George Vilos, Executive Director of Commercial & Business Development, Fraport Greece Management. Trade between the UAE and Greece continues to grow. Currently there are more than 170 Greek companies registered with the Dubai Chamber of Commerce, while non-oil trade between the UAE and Greece exceeded $212 million in the first nine months of 2017, a growth of 10 per cent over the same period in 2016. Greece has also been working closely with the UAE to development platforms to target compelling investment opportunities found in key sectors of Greece’s Economy. “Thessaloniki remains a popular leisure destination and with the start of these flights, we expect more passengers to take advantage of our reliable and affordable services to discover this beautiful country,” Jeyhun Efendi Senior Vice President, Commercial Operations at flydubai added. flydubai provides its customers with a better travel experience by offering greater choice and flexibility. With flydubai’s Business Class, passengers can enjoy a more personalised flying experience while Economy Class offers comfortable seating and a convenient way to travel. On flydubai’s newest aircraft, the Boeing 737 MAX 8, the efficient and environmentally friendly aircraft features a new cabin offering a flat-bed in Business Class for passengers to sleep comfortably during their flight. Economy Class offers new RECARO seats, which are designed to optimise space and comfort. flydubai also offers exceptional inflight entertainment with a full HD, 11.6-inch screen, featuring more than 1,000 hours of movies, TV shows, music and games in Arabic, English and Russian. Commenting on the launch, Alexander Zinell, the Chief Executive Officer of Fraport Greece said: “I wholeheartedly welcome the start of flydubai’s year-round flights from Dubai to Thessaloniki. Our commitment to the local communities in Greece has always been the introduction of more flights and new services connecting this beautiful country with the rest of the world. More travel options and more connectivity will result in more passengers and help drive Greek tourism. 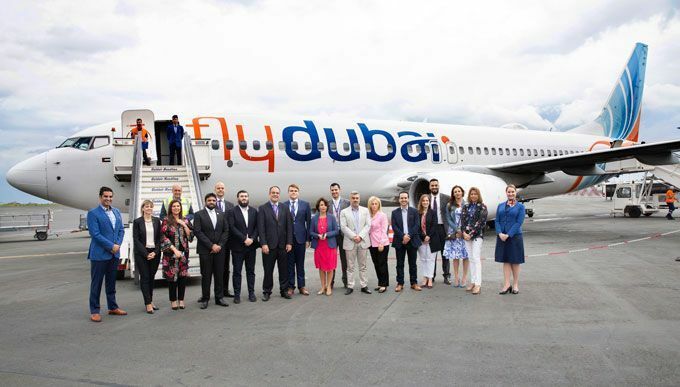 “flydubai, our latest airline partner, begins its service connecting Thessaloniki with Dubai. Travelling between those two enchanting destinations is now easier than ever before. I would like to thank the flydubai team for working with Fraport Greece and realizing for the first time ever this very important route,” Alexander Zinell, the Chief Executive Officer of Fraport Greece added. With flights to Catania in Italy, Dubrovnik in Croatia, Krakow in Poland, and the start of flights to Helsinki, Finland in October, flydubai’s route network in Europe will reach 27 points. Αναρτήθηκε από geop στις 3:28 μ.μ.